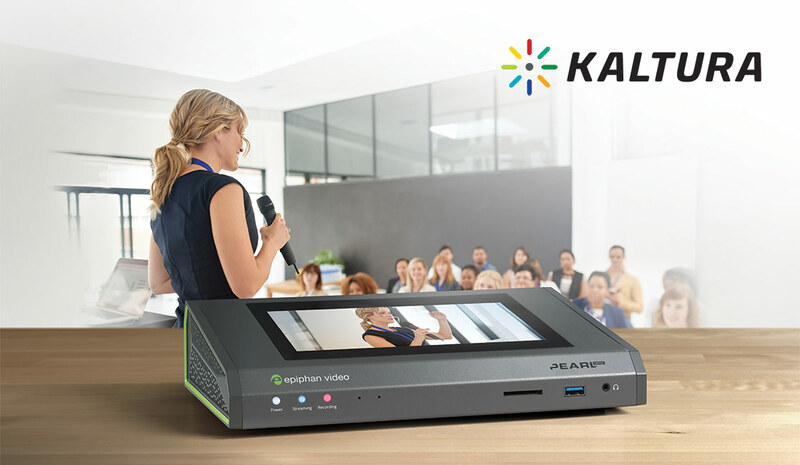 Palo Alto, CA, January 16, 2019 – Epiphan Video, a leader in professional audiovisual capture, recording, and streaming products, is showcasing full API integration with Kaltura Content Management System (CMS) and the first-ever Crestron Control Module for the Pearl family of all-in-one video production systems. The Pearl family of hardware encoders now support scheduling of multi-view VOD and webcasting events directly within the Kaltura Management Console. Pearl’s built-in touch screen and Admin panel allow for quick, visual event monitoring and one touch starting and stopping of ad hoc recordings on the fly. “Pearl -2 and Pearl Mini are perfect video encoders for easy, secure lecture capture on enterprise networks now that they support scheduled and unscheduled VOD and streaming events for Kaltura in addition to 802.1x network security, which we added last Fall.” says David Kirk, Vice President of Marketing at Epiphan. Also new for ISE this year is a Crestron Control Module for Pearl that lets developers and system integrators more easily integrate Pearl encoders in to Crestron systems. Attendees at ISE 2019 are invited to join the Epiphan Video team from February 5-8 in Stand 11.B110 at the RAI in Amsterdam to discuss the possibilities Pearl has to offer. Get hands-on demonstrations and meet with Epiphan’s executive team to ask about these latest, enterprise solutions for secure video content capture and delivery. If you would like to arrange a private meeting or demo with an Epiphan team member at ISE 2019, contact info@epiphan.com with your preferred time and date of meeting.